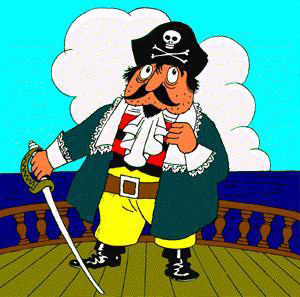 Captain Horatio Pugwash made his debut in a comic strip format in the first issue of The Eagle in 1950, then appeared regularly as a strip in Radio Times. In 1957 the BBC commissioned a series of short cartoon films produced by Gordon Murray. Ryan produced a total of 86 five-minute-long episodes for the BBC, shot in black-and-white film, but later transferring to colour. Ryan used a real-time technique of animation in which cardboard cutouts of the characters were laid on painted backgrounds and moved with levers. The characters' voices were provided by Peter Hawkins. The last series of Pugwash shorts by Ryan was produced in 1975. Although there are many anachronisms in the series, the book The Battle of Bunkum Bay gives some useful clues as to the era in which the stories are set. In this book, the King of England strongly resembles George I and the King of France resembles Louis XIV, suggesting that this story took place in 1714-15. 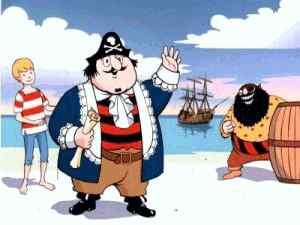 However, one of the few direct references to a date is in the original TV series is the episode 'Pirate of the Year' where Pugwash enters the "Pirate of the Year contest 1775"
A number of spin-off books were written by John Ryan, and in the 1980s he drew three new Pugwash comic strip storybooks: The Secret of the San Fiasco, The Battle of Bunkum Bay and The Quest for the Golden Handshake. 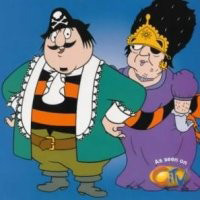 The rights to Captain Pugwash were purchased by HIT Entertainment, who from 1997 have issued a number of digital and part computer-animated cartoon films based on the Pugwash character, set on the island of "Montebuffo", "somewhere in the Spanish Main". Peter Hawkins did not provide the voices, HIT Entertainment instead employing character actor James Saxon. A DVD containing 'ALL 30 heroic high sea adventures from the classic 70s TV series' filmed in colour (156 minutes running time) was given away with the Sunday Times on 20 January 2008. A related book by John Ryan was Admiral Fatso Fitzpugwash, in which it is revealed that Pugwash had a medieval ancestor who was First Sea Lord, but who was terrified of water. The pompous but likeable captain of the Black Pig. Although he boasts of being the "bravest buccaneer", he is actually quite cowardly and stupid. His greed often gets him into trouble. Despite all this, he usually wins the day - either with the help of Tom the Cabin Boy or through sheer luck. Strangely enough, despite being a pirate, he is rarely seen committing any acts of piracy. A somewhat dopey character, who has a tendency to use malapropisms and to mispronounce common words. He has a teddy bear in his bunk and is quite mild-mannered. It is not entirely clear why he is the mate, as he does not appear to have any authority over the rest of the crew. He was present in the first ever Pugwash story, in which he was depicted as being constantly sleepy. The most aggressive of the pirates, but in reality just as harmless. He is quite rebellious and grumpy, and is perhaps marginally more intelligent than Willy, the Mate or the Captain. He was not present in the 1997 series. "No good will come of this, mark my words!" A simple sailor from Wigan. He appears to be the youngest crew member (apart from Tom). He is a gentle soul, and is against using violence. He does, however, have the occasional brainwave and has been the crew's saviour (admittedly sometimes more by luck than by design). "Just you wait till we get back to Wigan - we won't half have a 'tail' to tell!" It might be argued that without Tom, Pugwash would have been sunk long ago. He is the most intelligent and resourceful member of the crew, the only one who can cook and the only one who can actually sail a ship. Although Pugwash would never admit it, Tom's ability to think up schemes is probably the only thing that prevents him from being a total failure as a pirate. Tom is an expert concertina player, and part of his repertoire is The Trumpet Hornpipe (the Captain Pugwash theme). He was portrayed with a Home Counties accent in the first television adaptation, and with an Irish accent in the 1997 series. Captain Pugwash's fearsome arch-enemy, captain of the Flying Dustman (a pun on the Flying Dutchman combined with a reference to the occupation of Dustman). When he is not scheming to bring about Pugwash's downfall, he is a rather more competent pirate than his enemy, and always seems to have plenty of treasure. He speaks with a stereotypical West Country accent, and is easily recognisable by his eye patch and enormous black beard. This character replaced pirate Barnabas, who featured in the older series. His catchphrase is "No good will come of this, mark my words!" This character lives at the top of the island in a mansion covered in vines. He talks very loudly and his head of guard, Lt. Scratchwood, usually acts as a megaphone. He is deeply in love with Donna Bonanza and attends to her every need. This pirate queen appeared in the second series when she hijacked the captain's ship to escape from the authorities. An Australian pirate who works for Jake. He almost always has a mug of grog in his hand. This character appeared in the original series, but never spoke, nor was he named. A Mexican who works for Jake who speaks little English. He repeats everything that Jake says, annoying him greatly. Again, this character was an unnamed, unspeaking character in the earlier series. The voice for the governor and the law for the town of Portobello. In charge of the guard and collecting taxes, he also spends his time chasing criminals. The series had a memorable signature tune The Trumpet Hornpipe which was played by accordionist Tom Edmundson and arranged by Philip Lane. He had learned the tune from Jimmy Shand. The tune appears to have been popular from the mid-19th century, but its composer and country of origin are unknown. In the United States it is known as the Thunder Hornpipe.